Expedia has some top notch Rota package deals Bundling your bookings is one of the easiest ways to save time and cash — and get your adventure off to a great start. Wouldn't it be nice to earn savings up to C$590*? Purchase your family's travel package on Expedia now! With more than 400 partner airlines and 321,000 properties to choose from on our extensive database, you won't have any trouble designing your ideal vacation. Can't wait for your trip to Rota? Looking for a few pointers about what to do while you're there? That's what we're here for! If you want to observe a real-life military facility, head to Naval Station Rota. Here, you can get a glimpse into the breadth of modern defence capabilities. Adventurers have an abundance of choice in and around this destination. It doesn't matter whether you're trying to beat par or just in the mood to brush up on your swing, you'll have a blast at Costa Ballena Ocean Golf Club. Still have some time to spare? Gain a better understanding of rural plant cultivation and agricultural techniques at Chipiona Fishing Corrales. If you're taking the youngsters, they'll love hearing about how the animals are raised. Wander the streets and soak up the local culture in Rota. Seeking out luxury getaways or cheap vacations? Expedia has at least 13 accommodations not too far from the city center, so finding a nice, comfy room won't be hard. 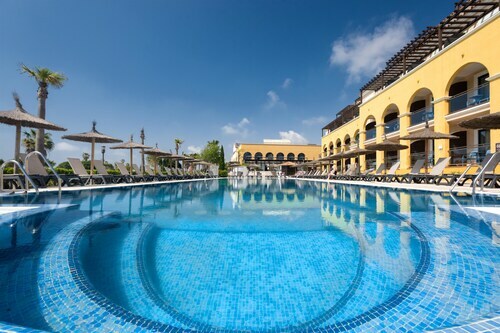 If you're the sort of person that can't sleep a wink unless they're lying on high thread count sheets, why not nestle down in luxury at the Barceló Costa Ballena Golf & Spa (Urb. 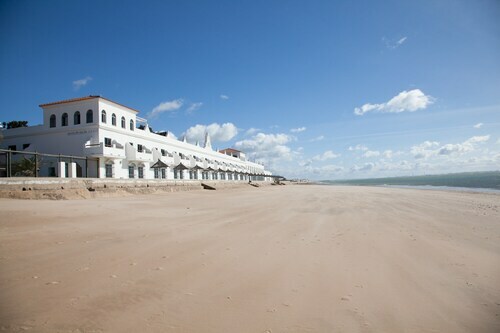 Costa Ballena. Avenida Reina Sofia) or the Elba Costa Ballena Beach & Thalasso Resort (Avenida Carla De Orleans)? If traveling on a budget's more to your liking, you (and your wallet) might prefer the Hotel Apartamentos Marina Luz (Avda De Sevilla 88), or the Hostal El Faro (Avda Del Faro 25). There's nothing as satisfying as finally touching down at Jerez de La Frontera Airport (XRY) after sitting down in a cramped cabin for hours. After you've claimed your luggage and shaken out those stiff legs, you'll find yourself about 17 miles (27 km) from Rota's downtown area. Located in Rota, this beachfront hotel is in the city center and within a 5-minute walk of Golfo de Cádiz and Luna Castle. Corrales of Rota is 1.9 mi (3.1 km) away. 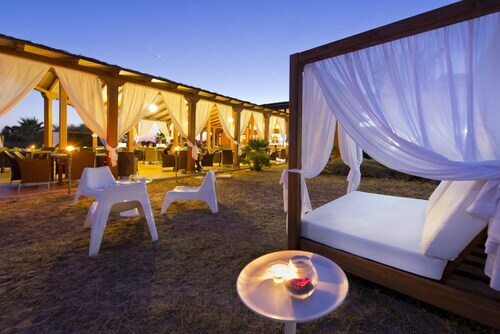 Nestled on the beach, this Rota hotel is within 1 mi (2 km) of Costa Ballena Ocean Golf Club, Ballena Beach, and Golfo de Cádiz. Playa de las Tres Piedras is 1.4 mi (2.3 km) away. This family-friendly Rota hotel is within a 10-minute walk of Corrales of Rota and Golfo de Cádiz. Luna Castle is 1.8 mi (3 km) away. Located in Rota, this beachfront hotel is next to a golf course, 1.1 mi (1.8 km) from Ballena Beach, and within 9 mi (15 km) of Corrales of Rota and Luna Castle. Barbadillo Winery and Gonzales Byass Winery are also within 20 mi (32 km). 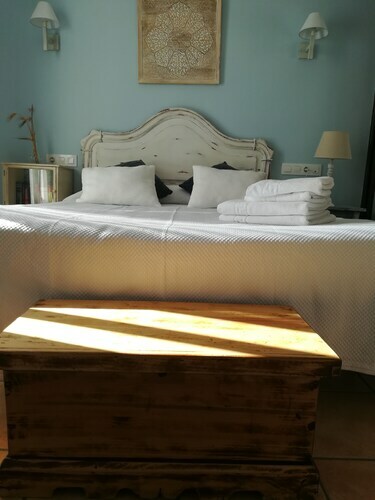 Situated near the beach, this hotel is within a 15-minute walk of Ballena Beach, Playa de las Tres Piedras, and Golfo de Cádiz. Costa Ballena Ocean Golf Club and El Camaleon Chipiona are also within 3 mi (5 km). Situated in Rota, this hostal is within a 15-minute walk of Luna Castle and Golfo de Cádiz. Corrales of Rota is 1.4 mi (2.2 km) away. Situated by the ocean, this vacation home is within 1 mi (2 km) of Ballena Beach, Golfo de Cádiz, and Playa de las Tres Piedras. Costa Ballena Ocean Golf Club and El Camaleon Chipiona are also within 3 mi (5 km). 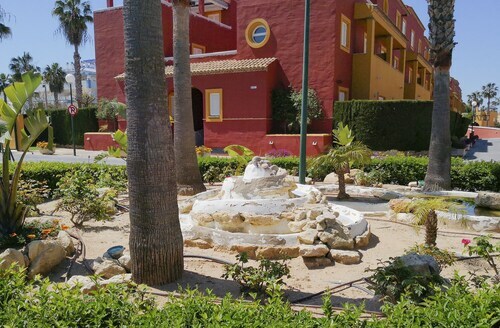 Situated near the beach, this apartment building is within 1 mi (2 km) of Golfo de Cádiz, Luna Castle, and Corrales of Rota. Costa Ballena Ocean Golf Club and Ballena Beach are also within 9 mi (15 km). Sat., 6 Jul. - Tue., 16 Jul.